Sample shows a 7" Baby Blue plate with Royal Blue Matte personalization color with EELI typestyle. Sample shows a 7" White plate with Pink Matte personalization color and EIDI typestyle. 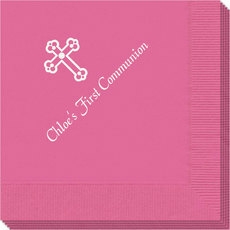 Sample shows a 7" Vanilla plate with Hot Pink Matte personalization color and EIDI typestyle. 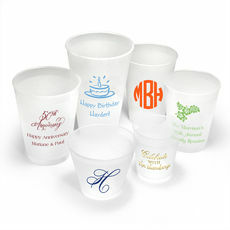 Make an occasion personal with personalized plastic plates! Your choice of plate color, plate size, personalization color and typestyle. Style your upcoming event with effortless entertaining. Personalization will always be centered. The Cross design will always appear as shown.